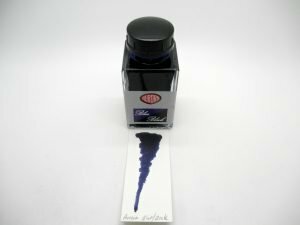 Aurora Blue/Black Fountain Pen Ink - Bertram's Inkwell New Aurora Blue/Black Fountain Pen Ink. Aurora Pen Company now has 3 – yes, that’s t-h-r-e-e, colors of ink! While Diamine may have 100, who knows how many colors Noodler’s has, and Private Reserve has 30+ colors, Aurora now has THREE! And what a color it is! Aurora inks probably have the best reputation. They’re known for having the richest, darkest black. Their blue ranked number one in the charts as a favorite blue by everyone for its depth of color. Most consider it to be the truest blue actually available. What makes this Blue/Black so exciting is you now have the best black and blue combined into one ink. Aurora used to be happy with the two colors they had, black and blue. No red, green, purple, or Vampire Red for that matter – just the two colors. And they did well with just the two. Long before there were brands like Private Reserve and Noodler’s, or even the thought of someone writing a review for ink, Aurora was by far the best selling ink on the market. For those that remember, Parker came close (or in some markets first) with the Parker Penman collection but even they had 5 colors. Parker discontinued the Penman inks in 2000, and today can command prices as high as $150.00 a bottle. 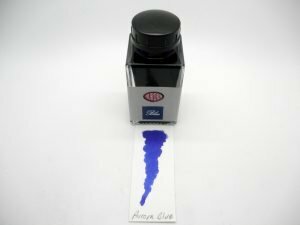 Aurora inks continued to chug along with rave reviews for their blue as a close second to the Parker Penman Sapphire blue and a black that was darker and denser then any other. Many brands tried to copy the Aurora blue but to date no one really has. With so many other brands with countless blues to try, it may be too late to have one single blue stand out above the rest. The exception is when it’s a limited edition. Well many years passed, and finally Aurora came out with another color. While it may seem like they just did a 70-30 split, the Blue/Black really is different in formula and consistency. I like this ink as a blue/black. There is a real depth to the color in that the saturation on the paper is complete. The ink does maintain a solid line when there is less ink flow from your pen. The Aurora Blue/Black ink is a winner in my book. While there are lots of others out there, I find the Aurora is bluer than most. Some blue/blacks have a grayish tone to them, which the Aurora does not. The ink has the same rich flow as the regular blue and black. Its ink coverage is on par with the best inks on the market today. Unless I need a really cool Monteverde Gemstone ink, or maybe the Pilot Iroshizuku ink. Then again, Platinum has the new Iron Gall inks……… Oh where does it end?! Thank You commenting on our post how else can we help?